<img title="IMG_9534Acrop" src="http://www.urbandreammanagement project plan.com/wp-content/uploads/2010/05/IMG_9534Acrop.jpg” alt=”” width=”560″ height=”412″ />We have now planted our first ever urban farm! 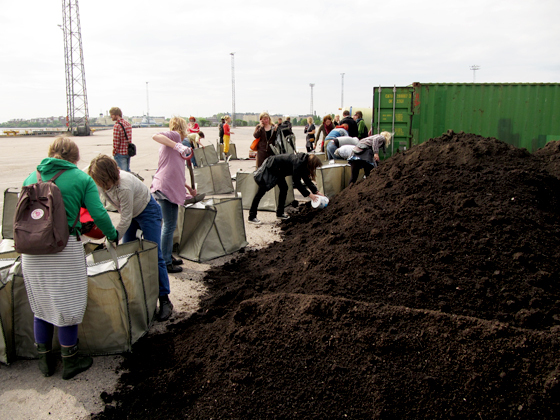 Last Sunday, Urban Dream Management took part in a project organised by Dodo: together with 35 other young farmers, we built an experimental field of gardening bags in the empty harbour of Kalasatama. During Sunday, we saw a number of different ways to carry soil: with buckets, baskets, shovels – and champagne coolers. Without much knowledge of farming, but with the love of good food and the joy of getting our hands muddy, we filled the bags, each with approx. 1000 liters of soil, and planted the first seeds and seedlings. It is exciting to see how easily a field of asphalt can be turned green: our farm consists merely of farming bags (originally from the building industry) filled with soil and laid on top of wooden flat racks to protect the plants from the polluted ground. Let’s hope that our zucchinis, chards, salads and herbs will survive the unpredictable weathers of early summer, and that we’ll see a lot of green in a few months’ time. As we have mentioned earlier, Dodo started their first experiment of urban gardening in Helsinki last year, with a guerilla garden in the Pasila rail yard. 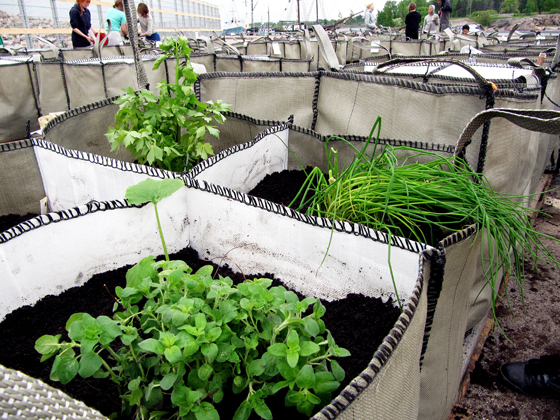 This year, they already have several other types of farms: along with Pasila and Kalasatama, they have also marketed courtyard farming solutions for urban housing blocks and started a project of urban apiculture. 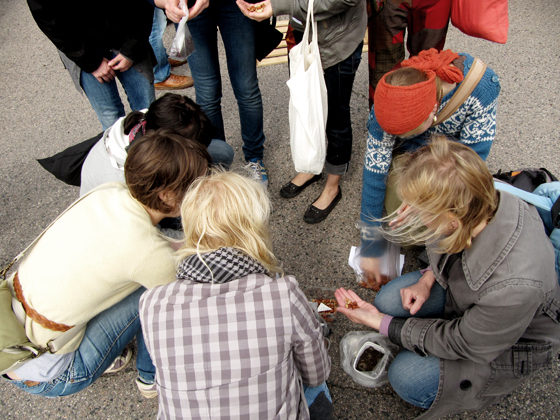 As a difference to the Pasila project of collective farming, the Kalasatama farm is based on individual groups’ own units, of which they are responsible. 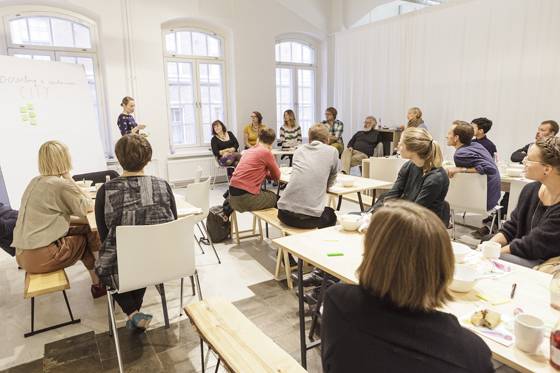 The Kalasatama bagfield experiment is part of the project of temporary uses and environmental art, organised in cooperation with design agency Part and the city of Helsinki. Along the summer of 2010, also other urban activities, events and art projects are going to emerge around the harbour. 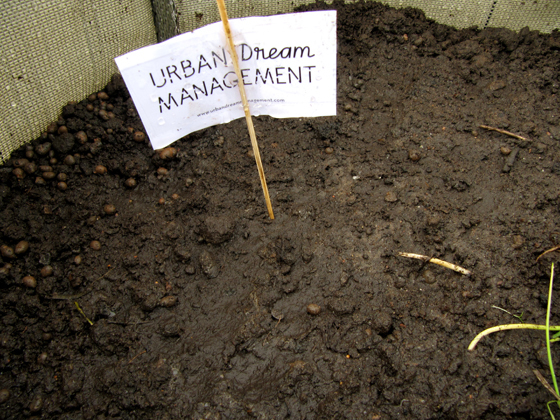 Urban Dream Management's farm yet looking a bit sad – but let it grow! Merveilleux! I bet our plants are growing like crazy as we speak.